"Many assume my business success has brought me happiness. But the way I see it, I am successful because I am happy." LEAD UP offers a flexible, highly individualised approach for the specific needs of each client or team for achieving high efficiency and the best possible performance with the aim of maximising the potential of the individual and the creation of sustainable success for your business. Our approach is holistic, as we believe having a successful career, a prosperous business, a happy life and all you dream of are inextricably connected. So, we work with our clients to achieve success, harmony, satisfaction, and balance in every aspect of life. Success is created and is a matter of constant personal development, improvement, and maintenance. We work with investors, entrepreneurs, business owners of small and medium enterprises, as well as with middle and senior management of large companies. An important part of our services is the training and mentoring of leaders who use the coaching approach in their work. We offer individual work with key personnel in your organisation and introduce the coaching culture for our customers who want to create new opportunities for the development of their business and employees. We believe that together with investing in yourself, the development of your employees is the best investment you can make in your own business. Experience shows us that when people in a company feel good, they are motivated, engaged, they develop a sense of belonging and are willing to give 100% of yourself. This permanent care for your employees is the key to creating a sustainable success. WHO IS BEHIND LEAD UP? 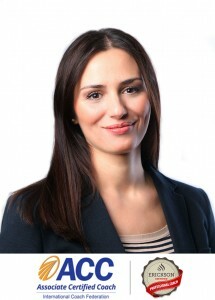 Silvia Trifonova – the founder of Lead UP – is a certified and accredited personal and organizational development coach, ECPC, ACC, a member of the International Coaching Federation ICF Global and ICF Bulgaria. Member of the Board of Directors of ICF Bulgaria – held the position of Director of Communications of the Management Board in 2016-2017. Her professional experience includes executive and business coaching, team, group and personal coaching. She is the only Bulgarian coach that has created an innovative approach in coaching, calling it ART COACHING – a method successfully used in working with corporate and business customers. Her professional experience as an entrepreneur and a business owner gives her an additional advantage. She knows the challenges faced by her customers and her expertise is work with investors, entrepreneurs, company owners, and senior management in organisations. “I work as a coach primarily with business owners, executives, investors and entrepreneurs for their continuous development and improvement as individuals, professionals and leaders. I pay special attention to building highly efficient teams and creating a harmonious working environment to support senior management and drive the success of the company. I also apply art coaching sessions successfully to this end. I believe that the best investment is in the development and success of the personal self. In this regard, I firmly believe that if you want to have a successful business, one needs to take care of the personal aspect of one’s personality in addition to the mandatory investment in one’s own development as a professional. One cannot be a successful businessman, if they feel insecure; one cannot be a good manager and have a problem with delegating; I do not believe a person can be happy if their work doesn’t bring them pleasure; or to be productive if there is something in one’s personal life that is holding them back. This is why I take a comprehensive approach towards my clients and we often discuss intimate topics in the business coaching sessions. From my experience as a business owner and my partnerships with many Bulgarian and foreign companies I know that the success and dynamics of the processes in a company depend on the people working there. People in leadership positions play a key role – they create a corporate culture, they set the standards and the tone of the organisation. It is important to pay particular attention to how we treat, how we develop and motivate people in the company. The examples that we set. Investment in employees, especially in key personnel is the best investment you can make for your business. Another important success factor is to work with people constantly, because nothing lasts forever. As Zig Ziglar explains it: “People often say that motivation doesn’t last. Well, neither does bathing – that’s why we recommend it daily. I believe that with holding a higher working position comes a greater responsibility to others. A person who works actively for their own development and that of others, has the possibility to create a better environment for a prosperous business, but also to contribute to the quality of life of the employees in a purely social human aspect. Only when a person works on themselves, they can he can be truly creative; to fulfill their talent; to find and follow their mission in life; to be a worthy leader; to create personal success and to contribute to the success of the community; to live and work in full, feeling a sense of satisfaction and harmony. Focus – we are experts in working with investors, developers, business owners and senior management. Our focus is on helping the personal, professional, and organisational development for our customers. Confidentiality and trust – our work is impossible without these two conditions. Therefore, we keep any information that customers share with us in the strictest confidentiality and create a workflow that is full of respect, acceptance and understanding. Everyone has the potential to succeed – this is our attitude towards each of our customers. Our job is to help them find their inner leader and learn to follow him/her. Create your success – we believe everyone creates their reality with the choices they make every day. Crating your own success – a prosperous business, a happy life, a united family, a career, etc. – is the result of continuous investment in your own awareness and development. This is a responsibility to ourselves and to others, because only when we are well, we can be helpful for our family, friends, colleagues, the business, or the society. Compliance with the Code of Ethics and Standards of the International Coaching Federation – our goal is to help people be more successful in their business and in their personal lives. We achieve that by applying our skills and experience and observe the best practices in the field of coaching. Quality guarantee – to provide you with the high-quality services, we offer coaching only by certified and accredited coaches, members of the International Coaching Federation ICF Global and / or ICF Bulgaria. Every coach in our team has successfully passed examination by the International Coaching Federation ICF Global.